When it comes to curry house classics we’re always recommending Bombay Express and we were excited to see their new Vegan Deluxe Set Menu for April. It expands upon the successful Veganuary menu with some special new treats. After the customary poppadom course we tried the new vegan starter. Billed as Dal soup we were served a flavourful, thin dal. Perfectly spiced and livened up with a wedge of lemon the soup was delicious. Plus it came in a super cute pan thing. For the main course we each ordered one of the new dishes to split between us. Both came with rice, channa massala (rich, slightly smokey, and always a favourite) and nann. We paid extra for one of the nann to come with vegan cheese on top. Cheese-topped nann is an old school guilty pleasure of ours. The cheese on top tastes like a coconut one which I’m not usually a fan of but works quite well with Indian food. When using the cheesy nann to scoop up the Vegetable Massala (apparently the first vegan massala in Devon!) I was transported back to my teens. And just like I remember from being a spice shy teenager it was creamy, comforting, goodness. We also ordered the saag paneer which was good but not quite as fab as the Veg Massala. The cheese was a little overwhelming in the curry. We finished, once again, with the delicious coconut tart and left happy. All the month long our local Indian take away and restaurant Bombay Express is serving up a four course Veganuary special. Some of the dishes are taken from their usual menu, some of them are brand new, all of it sounded delicious, and with members of the local Vegan Facebook group planning a meet up we thought we’d eat in for a change. After popadoms for the table the vegan menu gives you the choice of vegetable spring rolls or vegetable samosas. Which was a little disappointing. Kate got the spring rolls and I got the samosas and aside from the shape there wasn’t much difference. The pastry was nice and crisp but the filling was pretty standard. The salad garnish of crisp lettuce, tomato, cucumber slice and lemon wedge is fine when it comes with your take away but looks a little plain on the side of your starter. There was more choice for the main. Kate went with her all-time favourite: saag aloo. I had channa masala. Both of these dishes are on our regular order and Bombay Express make them well. I especially like the channa masala, the sauce is silky and the chickpeas are cooked just right. We each got a side of aubergine bhajee, naan bread and a rice. I wasn’t expecting to be that excited by the naan but I was. I love a plain roti but there is something special about naan which I didn’t realise I even missed before I bit into it. The aubergine was lovely too. The sauce was flavourful and it was the high point of the meal. So I stole Kate’s portion while she wasn’t looking. We really enjoyed our main. It was a struggle to leave room for the dessert. But we did. Because we knew what was coming. Coconut Chocolate Tart. It’s gluten free, it’s vegan, it’s delicious. It’s everything you want in a tart. The chocolate filling is smooth and light. You barely know you’re eating it. Then you realise you have no more chocolate left, sob a little and hope it stays on the menu past the end of January. Bombay Express is at the top end of Belgrave road and their Veganuary Menu is available for the rest of the month. I’ve written about Offshore, their vegan menu and their surprisingly meaty burger before but I’m a bit of a completist so I wanted to go back for breakfast. We had the chance over Christmas when it was one of the few places open that were dog friendly. Well it’s dog friendly outside but with the mild climate of the English Rivera, heaters, and our coats on it was good enough for us. For me it was avocado and lime on a split English muffin. Took a bit of explaining when the chap taking our order thought I wanted the version with the poached egg but we got there in the end. Now I’m going to say something controversial. I think there was a bit too much avocado on this one. It was heaped on. So for the first time I’m going to recommend the avocado be spread a bit more finely. That felt odd to say. Kate was onto a winner though. She ordered the vegan version of the full English. I think this is the best vegan full English in the bay. As much as I like home made beans and vegetables instead of sausages sometimes I just want Heinz. To everything there is a season, sometimes you have to go with the classics. Here they have done the classics really well. That sausage was meaty and perfect. The beans came out of the tin. There were hashbrowns. Best full English in the bay. Visto Lounge – part of the Lounges chain – has been a staple of vegan eating in Torquay since it first opened. There is a full vegan menu available including brunch, tapas, larger dishes and some deserts, though I’m told the chocolate torte is often sold out. Why has it taken so long for me to try it for the blog then? Well mostly because the menu doesn’t appeal to the other half. Most of the vegan options involve sweet potato, falafel, avocado and/or black beans in different combinations. Which gives you a good selection of options unless you don’t like any of those things. So I went alone. The location is one of the best in town, with a view of Torre Abbey sands available from the huge windows or the outside seating. It’s also dog friendly, perfect for when my Dad comes to visit with his Doggo. The decor inside combines industrial elements with well worn, mismatched Cafe furniture. It looks great but the high ceilings make it super loud. Fun, but not a great place for an in depth chat or a romantic dinner. I ordered the Sweet Potato Falafel Burger (two out of the four!) which came with vegan slaw and fries. The fries came in a mug even though there were clearly more fries than space in the mug. Just put it on the plate guys. That’s not my only complaint about the chips. I found them incredibly greasy, and left feeling a little queasy. The rest of the food was great. Which made the chips even more disappointing. The burger was just right. The sweet potato falafel patty tasted great especially with the added crunch from the gherkin and lettuce. The beetroot hummus pulls everything together. It’s probably one of the best burgers in town. I’m definitely going to go back to Visto Lounge but with realistic expectations. The menu isn’t as diverse as it looks and the quality of the food is hit and miss. What will keep me going back though is the location, and the place being dog friendly. Bombay Express is our local Indian and while I’ve known for a while that it has vegan options I’ve been reluctant to try them. I do prefer to go to places were vegan options are marked on the menu because I’m awkward and panic easily. But recently they had an offer for world vegan day so I held Kate’s hand and bravely went in to ask what we could have. There is quite a lot of choice. You can have a vegetable balti, jalfrezi or madras. There’s also garlic chilli vegetable on the menu. Bombay potatoes, aloo gobi, channa massala, tarka dhal, saag aloo and mushroom bhaji can all be ordered as a side or a main. So between me and Kate we polished off four side dish sized portions. 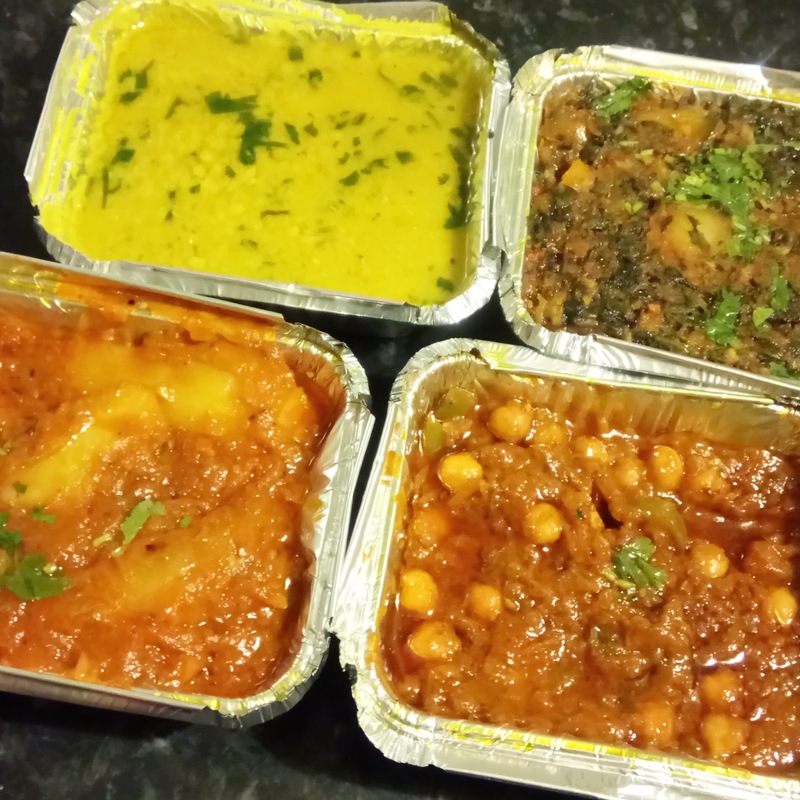 Clockwise from top left we have the dhal which is super creamy, a saag aloo that’s full of flavourful spinach, a rich channa masala and a delicious portion of Bombay potatoes. It’s always great to have another vegan take away option, it’s brilliant to have one that is so very yummy. I have a love for food shopping that leaves most people baffled and questioning my sanity. Unfortunately I just don’t have very many tips and tricks. I’m not really organised about my food shopping. I have found some fun products in my time thought. If you’re in Torquay all of these were found in the Newton Road branch. Some things you just buy to amuse yourself and these crinkle fries are one of those things. Crinkle is the second best shape for a chip after curly and bacon is, apparently, the greatest flavour. Put them together and what do you get? A chip that tastes like a warm frazzle. That’s not necessarily a bad thing. Find them in the freezer section with the other chips. Made with oil and not butter these doughballs are suitable for vegans. That does make it oily though. Have a napkin on hand for when you eat these. They are deliciously garlicky and and are perfect on the side of your pizza or pasta. Find them in the freezer section near the pizza. Mint with chocolate on top. Own brand After Eights but without the dairy by-products. Delicious. It’s mint and chocolate, what more can I say. Find then by the sharing sweets. When the Kind Grind opened back in July they didn’t have a kitchen which meant they only had cakes and pre-packaged snacks. I’m not complaining, I love both of those but sometimes I wasn’t something a little more savoury. Luckily in the last couple of months they’ve got the kitchen fixed up and brought new additions to the menu. Exciting. If you are around for breakfast you can get yourself a lovely crumpet with a variety of toppings. Come lunch and you can get a mezze platter, a baguette, a panini or try a special. We’re going to talk about the paninis today. Because it’s cheese themed! Kate went for a cheese and pesto panini. I think, technically it comes with tomatoes but she asks for it without large slices of vegetables. It was yum. The cheese is delicious. Importantly they also get the timing on the panini press just right. I’ve been burned by an over cooked panini before. Literally. Typically, I had mine with chilli. My love of chilli is, I think, rather well documented. I’m loving it. It may have become my favourite quick lunch. And I can’t help but being excited that vegan cheese has gone from barely edible to delicious in the last few years. Not to mention how great it is to have a local vegan cafe!